I know. Officially, it began a week or so ago. But, today it really feels as if it's here. It's downright cool and my feet are protesting these smothering objects called socks, "Let us out! Let us breathe!" Last night for dinner, I ended up making a meal that paired summer and fall together, even though two nights ago I made a cool weather meal (turkey leek soup from last winter that I had to move out of the freezer to make room for the applesauce, to which I added corn and orzo). 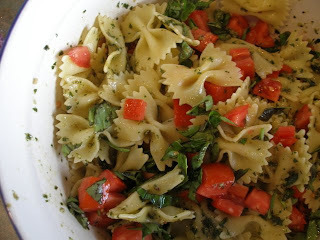 Drain the pasta and transfer to a large bowl. 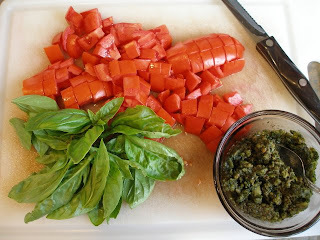 Drizzle with olive oil and toss with remaining ingredients. Eat warm. Ironic it's a summer meal. It looks rather like Christmas. 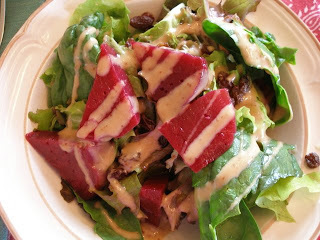 Mixed greens and spinach, topped with cooked and salted beets, raisins and dressing. 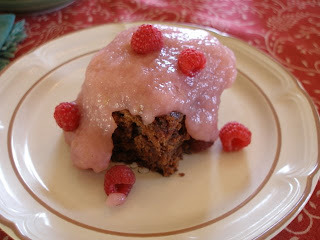 Secret Chocolate Cake (from Simply in Season) topped with applesauce and red raspberries. The 'secret' in this recipe is that there are pureed beets inside. Shhhhh. Don't tell the kids. I skipped adding the chocolate chips and didn't ice this cake, because, as I told you yesterday, I don't keep those things on hand. You won't miss them if you top this cake with applesauce and red raspberries, but if you don't, you may want to include them. I have visited all over your blog and am impressed and jealous! I thought I would be a gardener and live from the land, but alas I failed. Given today's life and times you are in a good spot! Loved, loved all the pics.